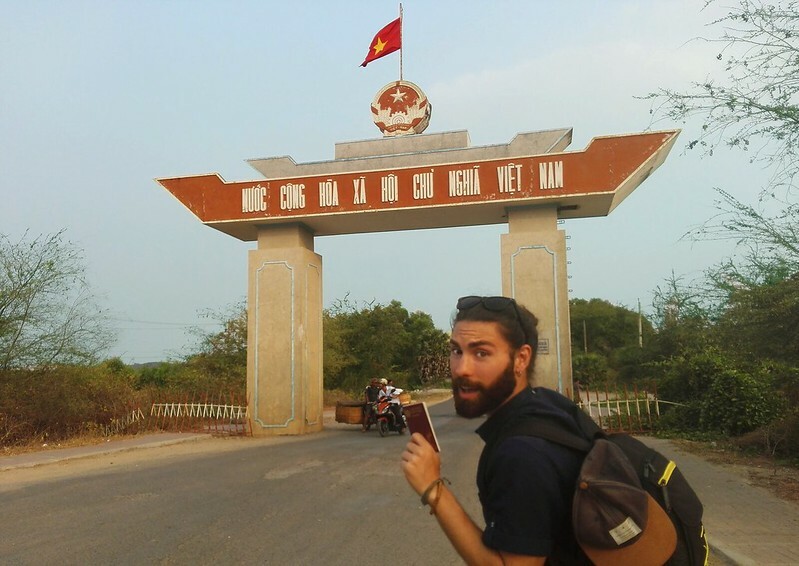 – If you want to cross the border without paying extra tourist fees, ignore the first guard. Walk straight to the second counter, get your passport stamped and move on. The guard on the first counter is there to charge money for a stupid temperature check. So that was the plan: to show up with a serious face and walk confidently towards the second counter as if we’d been there before. Didn’t work. We got called immediately to the first counter, had our temperature checked with an infrared gun and got charged for it. Luckily it was only 1USD. 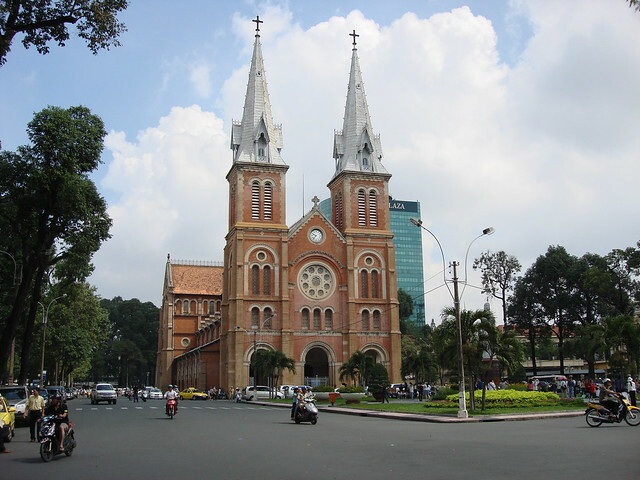 Two hours later we reached Hatien bus station where we waited for a night bus to Ho Chi Minh. Restaurants all around were full of people eating and waiting for departure. Having a 10-hour bus trip still ahead of us, we decided to eat something on a plastic table and tiny stools right next to the buses: pork noodles à la exhaust smoke. Yum! They look like tour buses and can be quite comfortable if you’re not 1.90m tall like we are. 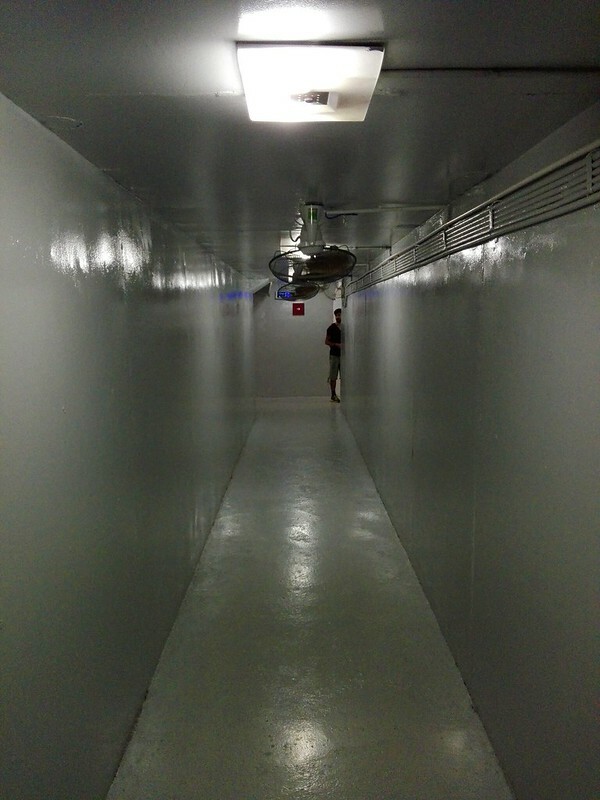 Each passenger gets a tiny bunker bed, a blanket, and wifi – if they’re lucky. The trip ended up taking around 8 hours, with a 20-minute bathroom break at a huge decked out service station where we tried our first pork steamed bun ever! 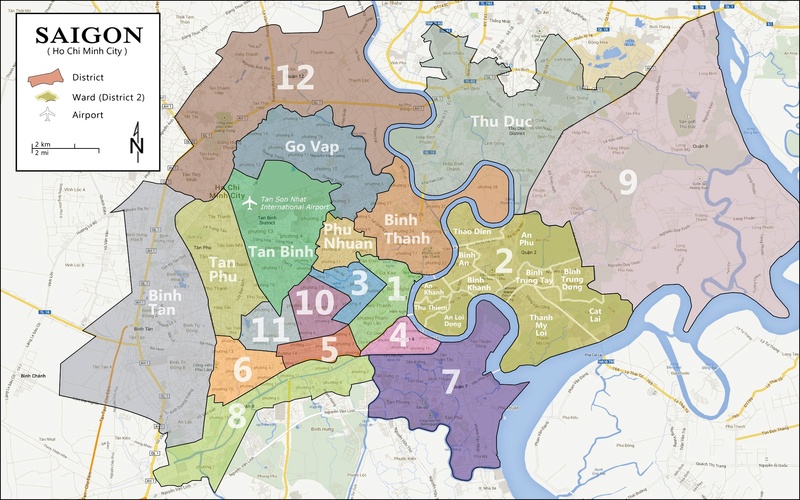 At 4:00 AM we arrived at Ho Chi Minh’s District 2 on a mini-van. 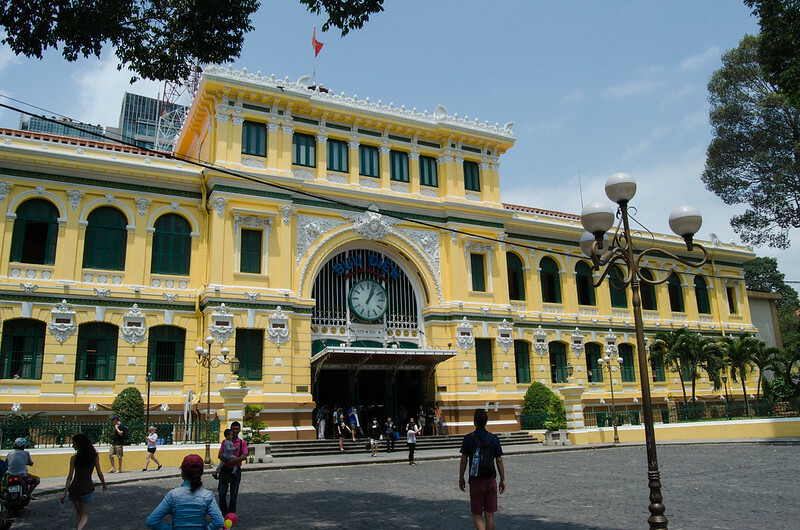 The city was quiet except Bui Vien street where tourists stroll around from bar to bar and sinister people covertly sold drugs – 10 seconds in, we were offered cocaine. Tired, we walked to a park nearby and rested on a bench waiting for the sun to come up. Around 5:00 AM the city started to wake up: cars and people moving around, birds chirping and pooping on my leg… We’re off to a good start! 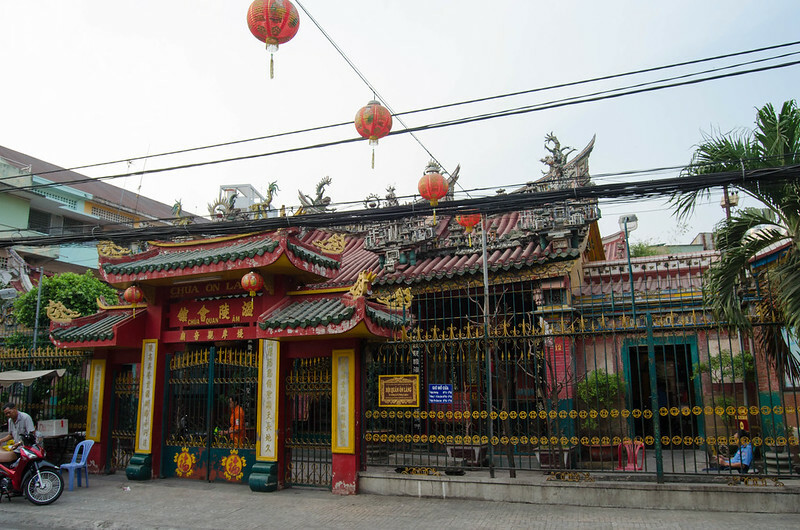 We stayed in Ngan Long Hotel, about 15 minutes walk from the backpackers street – Pham Ngu Lao. Being first thing in the morning and unable to do an early check-in, we left our bags in the reception and went out to explore District 1. 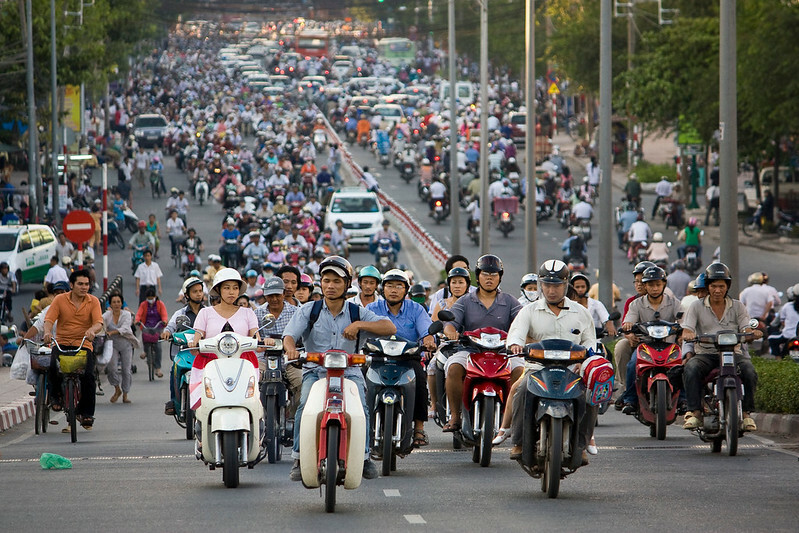 Ho Chi Minh City is the largest Vietnamese city where something like 9 million people live. The urban part is divided into 19 districts and we were housed on the first. 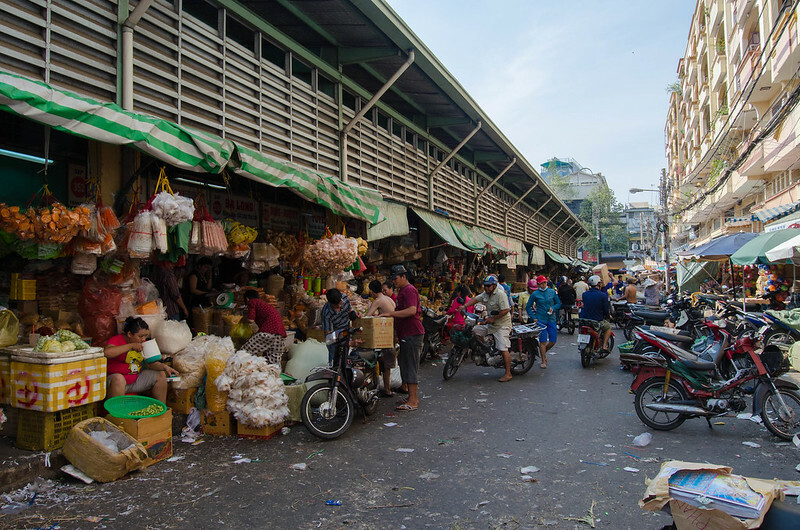 Around the backpackers street in District 1, most businesses are geared towards tourism: Western-style cafés, restaurants, pastry and souvenirs shops. Narrow streets become wider avenues when you walk towards the river and you’ll find yourself surrounded by financial buildings, fancy shops, and the classic Opera house. If you’re into books, there’s a massive bookstore called Fahasa on the Nguyen Hue Street, filled with English books at Vietnamese prices (like half the price you can find them in Portugal). 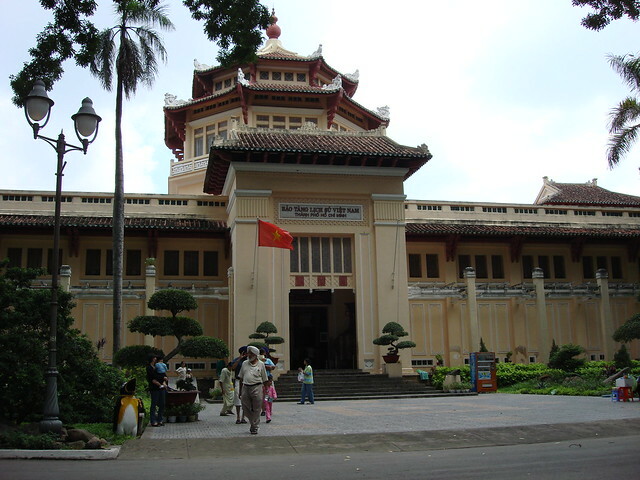 We walked along the sidewalk by the river to the Vietnamese History Museum. The museum is located in the same area of the Zoo and the Botanical Garden. 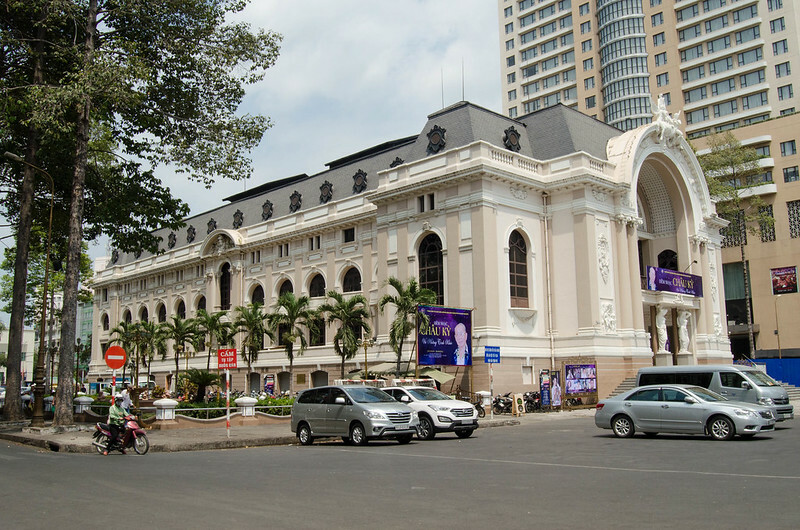 The entrance was 0.59€ and inside you’ll find history from all periods of Vietnam: since the pre-historic to the latest dynasties. It’s a “classic-style museum”, not one of those modern ones with interactive panels, video, and sound. 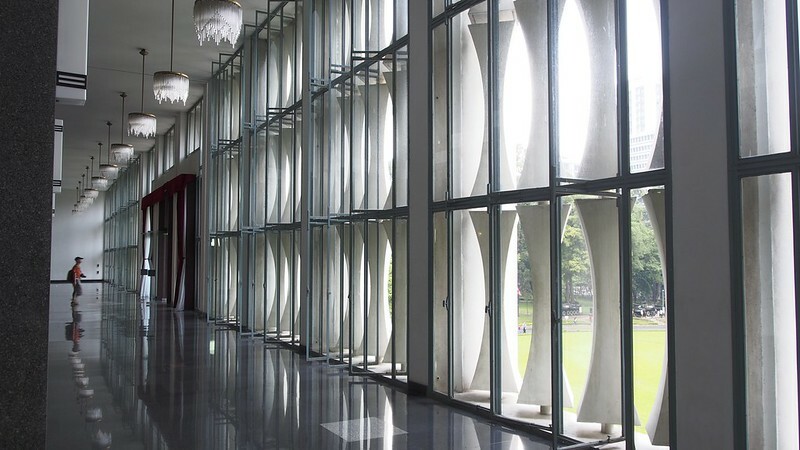 Later we visited the Independence Palace, a building associated with the history of Vietnam’s war, home of the president of the south and the last stronghold to be conquered by the northern army. The entrance was €1.18 and it took 1 hour and a half to visit the garden and the various levels of the building including the underground bunker. 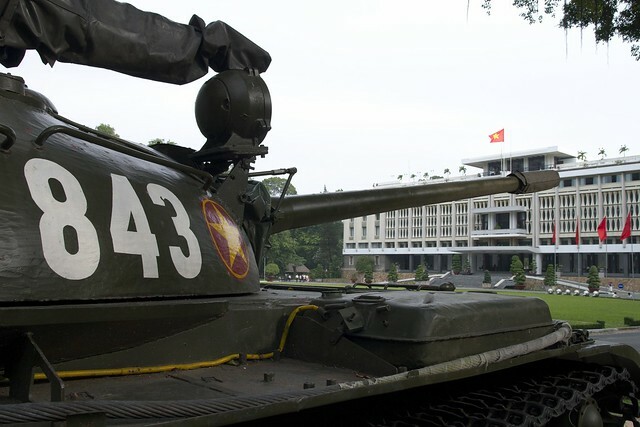 The bunker was built after the president’s own air force bombed the palace trying to kill him. 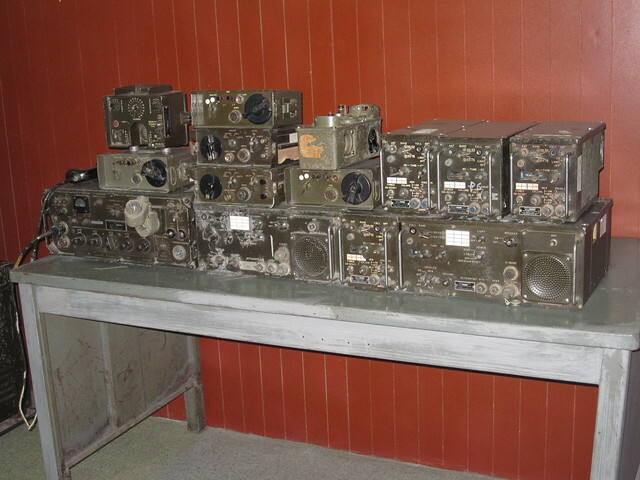 It’s astonishing to be down there among war maps and 70’s radio transmitters. 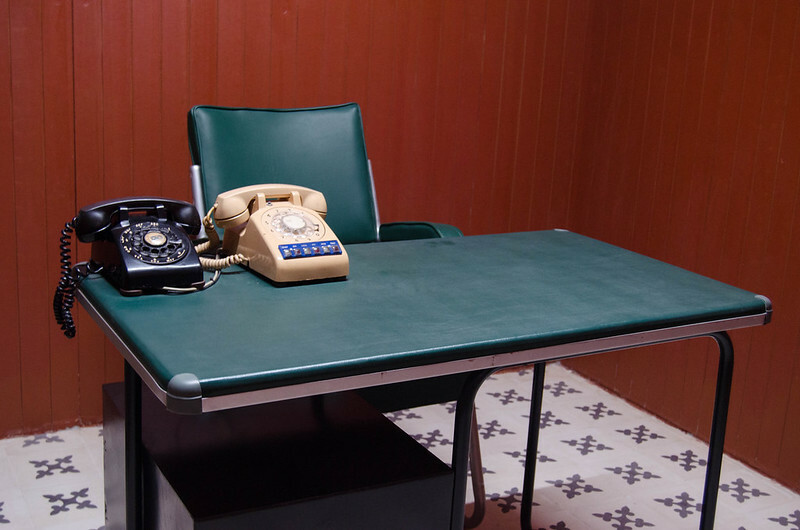 The place feels heavy and claustrophobic, there’s a weird tension in the air as if one of those old telephones could ring at any moment. After visiting the Palace we walked along the large avenue right in front of it to see The Notre Dame Cathedral. Unfortunately, it was closed on both days we tried to enter. 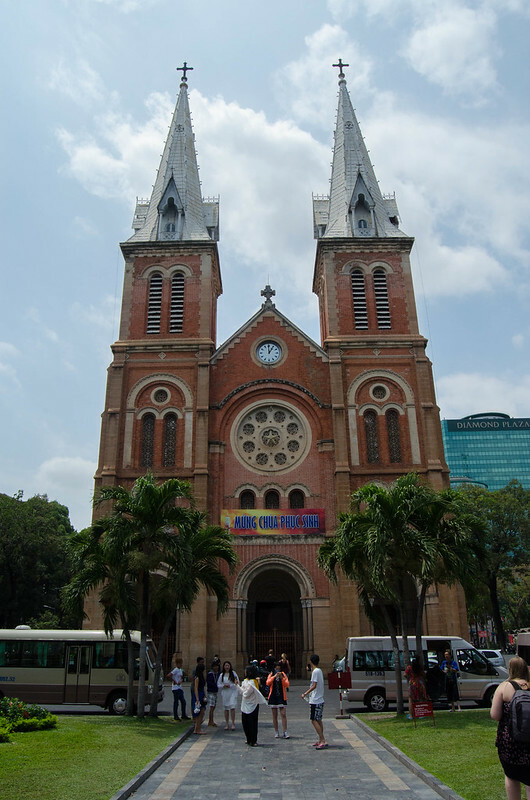 The cathedral was built with red bricks imported straight from Marseille and today it represents the influence French settlers and Catholicism had over the city—Catholicism is still the second largest religion in Vietnam. We were told that in the days there’s mass, locals park their motorbikes around the cathedral and listen to the priest from the bikes, never bothering to go inside. Still on the subject of French-influenced architecture, right next to the cathedral is the Central Post Office, a very well maintained building where you can get in for free, enjoy the beautiful interiors and dispatch a few postcards to people back home. 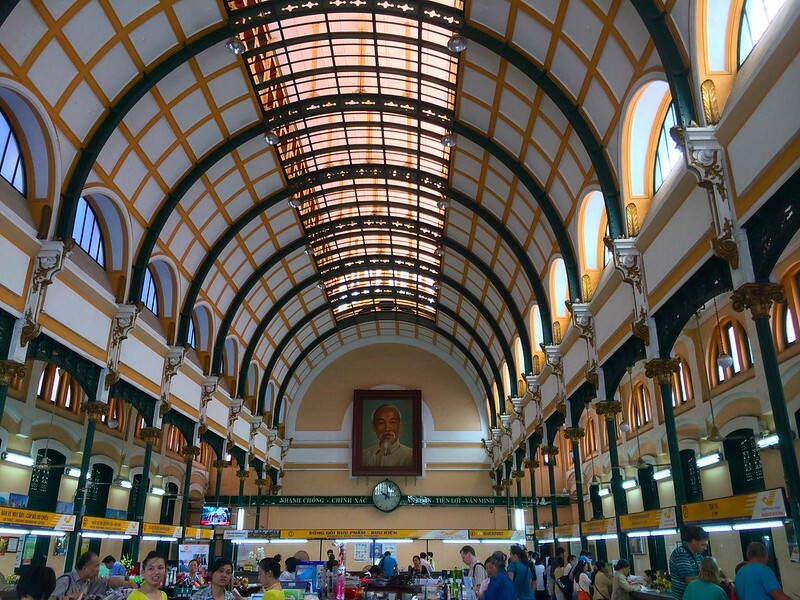 The post offices still work and are used by the Vietnamese to this day. From District 1 to District 5 get the blue bus Nº1. It’s a 5km ride that costs €0.20. 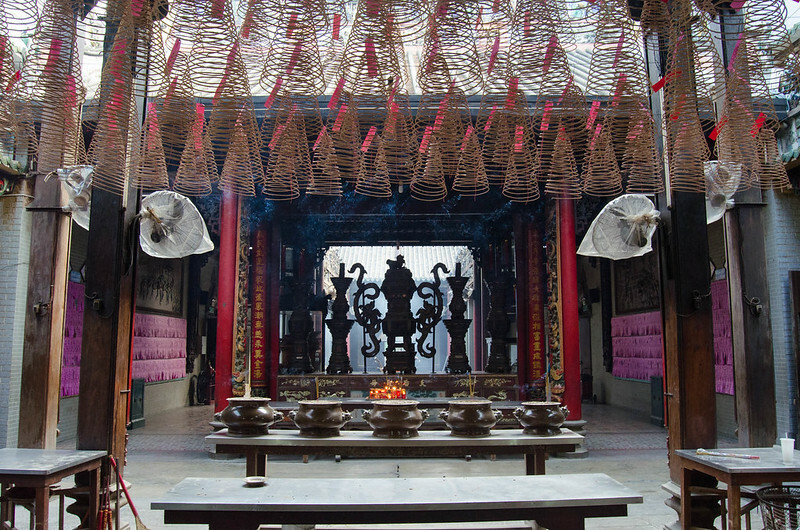 Cholon has an immense Chinese community and it’s like a small town itself. 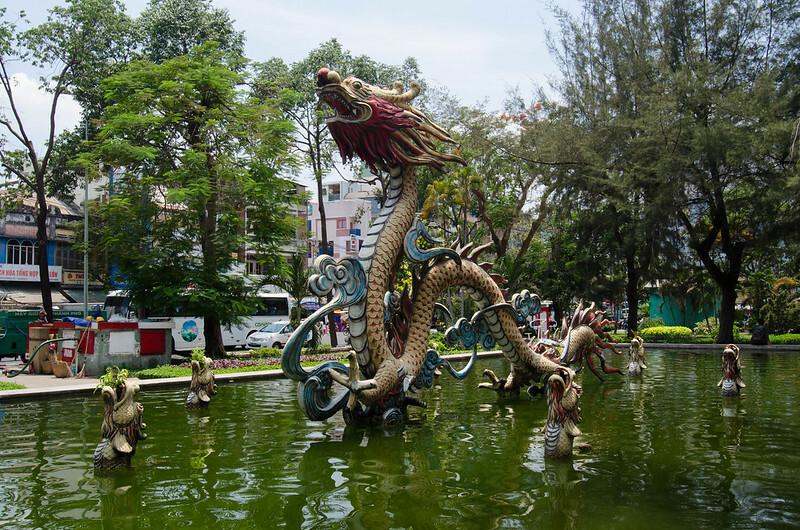 The Chinese influences are all throughout the area creating a unique atmosphere: authentic restaurants, pagodas, and markets like the busy Binh Tay Market where everything is bought and sold, makes up for a great day. We spent our afternoon sightseeing, walking, eating fruit and taking pictures. By the end of it, we headed back to the city center in the same bus, the Nº1. The bus rides and the experience of being pedestrians around town showed us how hectic the traffic is. People crossing the road feinting each other, hundreds of scooters gathering at the red traffic lights, while others speed up and cut corners as the light turns green. Once a Khmer fishermen village, centuries of conquering, colonization, and political change made Ho Chi Minh City a cultural global center. Locals were friendly and interested in other cultures, approaching us time and time again to make conversation even if just to practice their English. If you have any questions or some extra info everybody can benefit from, leave it down in the comments! Thanks for an interesting post. My only concern is I have a young child in our group so a scooter tour will be out of the question. Is it safe to walk around and cross the streets?